The official currency is the Cayman Islands dollar (KYD), which is pegged to the US dollar at a fixed rate: 1 KYD = 1.25 USD. According to Economics and Statistics Office, nominal GDP of Cayman Islands in 2015 was 2.8 bln KYD. Cayman Islands outperforms the European Union in terms of real GDP growth with	the average annual differential coming to 0.0%	over the past 3 years (2011 - 2014). In 2014 real GDP growth was 2.4% which was above the Euro Area average (0.9%) and above the European Union average (1.3%). Chart 1. 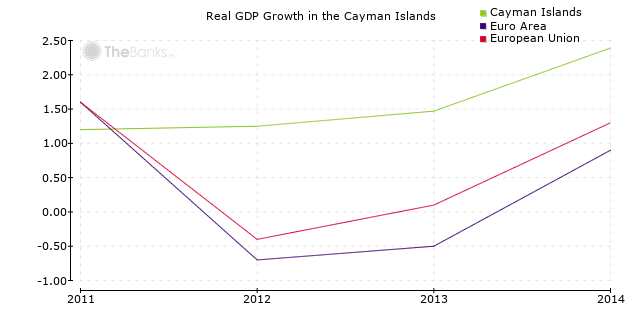 Real GDP Growth in Cayman Islands. Source: Economics and Statistics Office. According to Economics and Statistics Office, inflation rate in Cayman Islands in 2016	expressed as annual percentages of average consumer prices was -0.6% which was below the Euro Area average (0.2%) and below the European Union average (0.3%). Chart 2. 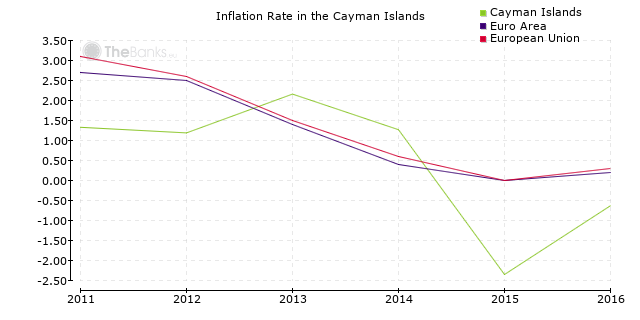 Inflation Rate in Cayman Islands. Source: Economics and Statistics Office. According to Economics and Statistics Office, unemployment rate in Cayman Islands in 2015 was 4.2% which was below the Euro Area average (10.9%) and below the European Union average (9.4%). Chart 3. 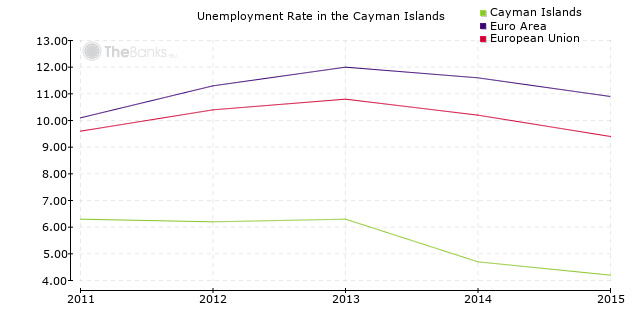 Unemployment Rate in Cayman Islands. Source: Economics and Statistics Office. The Cayman Islands has a sovereign credit rating assigned by Moody's: the rating is Aa3 (high grade), outlook stable.